Francesco, his darling wife Rina and their son Enzo lived a quiet life in the pretty town of Lucca, Northern Tuscany. But their lives would soon drastically change, and it all started with a few pieces of jewellery. Yes, Rina adored the beautiful pieces Francesco had once gifted her. Seeing how she cared for the jewellery, how she cherished them every single day, and how she wore them with pride made his heart melt. And with this, an idea had been planted. He developed a keen interest in jewellery, and every single evening walking home from work with his cousin Roberto, Francesco would walk past the jewellery stores in Lucca, grumbling to his cousin about all the ways he wanted to improve the different pieces. This was exactly the push Francesco needed. The very next day he resigned from his job and began working tirelessly on his new vision: To create a jewellery collection that represents his love of Italy and modern design, that expresses the true beauty of a woman and her unique style and personality. After weeks of long days and unwavering enthusiasm, he had finished designing his first collection, consisting of a small selection of 18-carat earrings and pendants in spectacular yellow gold. Proud and confident in his work, Francesco canvassed the narrow streets of Lucca going door to door to potential customers, and within a week he had sold out of every single design. He’d always felt his collection was something special, and now he knew this was true. Indeed, Francesco was so very proud of each piece and always strived for absolute perfection. It would take him months to plan, design – and then redesign – each and every element, until he was whole-heartedly convinced it was as perfect as could be and captured precisely the message he wanted to convey. Now, here we are many many years later, in 2018 – still staying true to Francesco ‘s and Rina’s values and vision, and still utterly passionate about keeping the remarkable Tesoro legacy going. 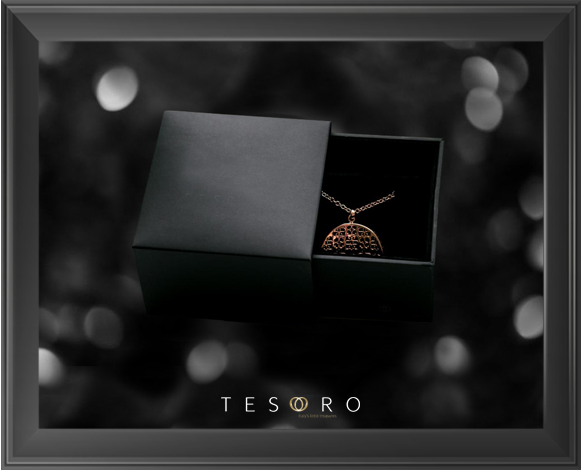 We can’t wait to continue the Tesoro vision for many years ahead, and wish to bring you with on our exciting journey.